Mercury retrograde ends on September 5th and Saturn is newly direct. September is a much more favorable month for contracts, commitments, decision making, and getting into routines. Some os us will see long term situations resolve and evolve with a new quickness. August eclipses affect this month especially at Full and New Moon times. The air begins to clear and communication is more reliable. We'll wobble and flip flop less and support each other in that way. Just like in yoga class, when one person loses their balance, others do too. By standing firm in your beliefs, resolve, and intention, you help others do the same. Virgo time is service time, the slice of the zodiac dedicated to assisting others including animals and the earth. Make the world a healthier or more joyful place this season, just by doing your own little part. The ripple effect is greater than you know. Live music, Free yoga, sponsored by Congress Square Arts, Portland, Maine. Full Moon, the Corn Moon, is at 13 degrees of the sign Pisces. Pisces Moon and Virgo Sun represent the mutable signs during this seasonal time of transitions. Routines will still be in flux since Mercury only just stations direct on the 5th. In the days ahead, perhaps around the 13th, routines and plans will feel more sure. Keep a bit of flexibility in your decisions. This might be a banner year for add/drop on college campuses everywhere. You may join a group and then decide it's not really for you. Pisces Full Moon is highly emotional and creative. On one hand, you'll feel all the feelings and realize you're making emotional adjustments and transitions. On the creative side, a burst of inspiration and inner knowing comes. Even through tears or a need for deep quiet, your intuition is likely to be dead on. Find some calm and solitude in order to fully attune to your inner voice. Take a walk by the water or swim in it. The energies of water and earth fuel us at this time (and always!). Relationship difference and ability to compromise come into play. Neptune is conjunct the Full Moon and you may really need to question and pursue the truth of the matter. Do not take everything at face value. Intuition presides over what you're being told. Words may not mean much during this September Full Moon. Ability to relate and empathize or act compassionately will heighten though, perhaps balancing the communication piece out. Actions mean more than words. See the reality and move out of denial or excusing behaviors. Mercury in Leo is creative with words and message. Do some inspired writing or designing and revive unfinished projects. You may complete something spectacularly between the 4th and 9th of September. New Moon forecast coming soon, for September 21st and the Autumnal Equinox. My current yoga schedule is at www.Rozoyo.com/yoga. On September 8th join me for Intro to Yoga Nidra, a guided rest for healing and manifesting, at Scarborough Yoga 5-8 pm. Link here. Wishing you peace and inspiration! "It's a wise person who rules the stars, it's a Fool who's ruled by them" advised Darrell Martinie. Robin's Zodiac Zone is an astrological mapping guide. Choose your own journey freely. This is the only RoZoYo® workshop of 2017 that flows through the 12 signs of the zodiac and includes some personal insights. Hope you can come! This Thursday, August 24th Virgo Season Yoga at Congress Square Park with live music by Todd Glacy, sound healer. Acoustic songs and percussion and wind instruments and hopefully Todd brings the gong. Very grounded and gentle yoga to lead us into Virgo season. Moon Salutations, seated postures, gentle twists or do seated yoga in the chairs provided. 5:30 pm-6:45 pm. Stop by and stay as long as you like. It's totally free! Congress Square Park is at High and Congress in Portland, Maine. Look for the colorful mural and chairs/tables. Sit a while and breathe well. Thanks for coming out to Sunflower Farm for eclipse yoga with the goats! See you there next season! Robin's Zodiac Zone has been much the same since July of 1999 when inspiration hit me during a beach snooze and I proceeded to go home and start my first website with the help of my 9 year old son. RZZ is all Leo, born around July 22nd or 23rd of that summer. And now it's Leo eclipse time, and a natural progression is underway. I was recently gifted a thirty minute reading with a local intuitive I'd never met before. The second thing she said to me in that reading was "Do you do a lot of different things, jobs? I feel like cleaning up all your stuff and organizing it." She also talked to me about working out of multiple locations. Of course I replied, "Yes, there are various things I do and almost always have had more than one job." That is so true it goes back to being a teenager who always had two jobs and maybe some childcare on occasion. I thrive on variety and have never had high paying jobs. I worked multiple jobs for both interest and prosperity. I also told her I love it all and couldn't see giving any of it up. This reader's words have been resonating with me for almost two months now. I looked at all I do and saw that I love and have purpose in all of it. However, I need to make some changes to streamline the flow of energy going into each thing. I have been looking at what the energy exchanges are. I never wanted to make Robin's Zodiac Zone a paid subscription or heavily monetize it. Other than astrology I write for publications, the weekly forecast has always been free. I'm not about to monetize in that way now. It doesn't feel right. I made decisions this week. Mercury is retrograde so it's unusual timing for an astrologer to announce news. Yet it's nothing I couldn't change or reverse in the future, and I feel okay with it. Beginning this Sunday, I'll post Robin's Zodiac Zone colors for the week and something about the week ahead on facebook and Robin's Zodiac Zone. I will also write a New and Full Moon forecast every month and it will be published between the 28th and 30th of each month. September's New and Full Moon forecast will be at RoZoYo and Robin's Zodiac Zone around August 30th. Colors will be published on Sundays. I'm leaving open an option to write more on special occasions like the beginning or end of a retrograde period. I will also write in accordance with any energy exchange such as donations. If I receive donations equal to the time investment, I'll post a special, timely blog for example. As always, readings will be available by email. If you want to consider a certain date or decision or are due for a more in depth check in with your chart and the cards, that's always available too. More info and investment for readings or coaching sessions is here. I also offer Private yoga and meditation to a limited clientele on a per session or weekly schedule. I've seen my yoga friends transform inside and visibly during months or years of their practice. Robin's Zodiac Zone is 18 years strong and ready to shift, like the 18 year olds going off to higher education perhaps. I hope you'll stay with me through the changes. ps WMNF Tampa monthly forecasts are also on pause for now. Do join Eluv on Ultrasounds on Thursday nights. She is dear friend and has so many intriguing and interesting special guests. WMNF listeners, thanks for your listening and loyalty for the past 3 years! 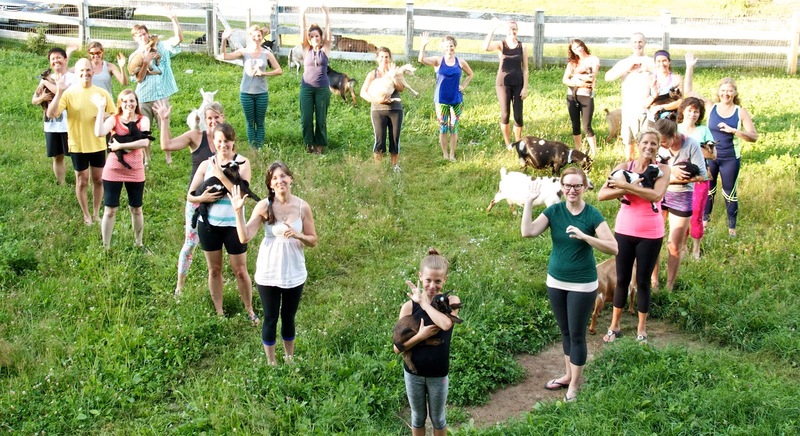 Zodiac Yoga with goats at beautiful, rustic Sunflower Farm in Cumberland, Maine Thursday, August 17th 5:30 pm. Donation yoga for Leo solar eclipse & summer season. I hope you can join us! It's 30-40 minutes outside Portland depending on traffic. Allow time, but if you're late, just come anyway. Next Thursday, August 24th Zodiac Yoga with music played by Todd Glacy. Free on Congress Square Park Portland. Yoga for Virgo season and a calming meditative practice with Gentle Flow. 5:30 pm (feel free to just enjoy the music, do chair yoga (plenty of chairs for you! ), and breathe with us. Thursday: Waning Moon as we get closer to solar eclipse of August 21st, Monday. Void Moon n Gemini 9:38 am to 12:13 pm EDT. Venus square Jupiter at 2:40 am EDT and it's natural to wake up with matters of relationship balance/imbalance and justice on your mind. As for the signs hosting these planets, Cancer is family oriented, holding closely and Jupiter worldly, favoring big ideas and experiences. You and a loved one may struggle through a transition such as one moving away, off to college, or needing a different atmosphere. We must reconcile ideas that don't seem to be in harmony, especially where our relationships are concerned. Education, the justice system, and long distance journeys are part of the picture. Gemini Moon aligns with Leo Sun and Uranus in Aries, the major players of the August 21st solar eclipse, giving us a glimpse or the first inkling of what's to come. Cancer Moon appeals to our reflective side. Today and tomorrow especially, be in natural environments, in or near water, or in sacred space that's an oasis from the busy chatter of the world. That way you can feel, even more than think. Today's color is White. Friday: Cancer Moon in harmony with Mercury retro and with Neptune (Virgo and Pisces signs). There's a sentimental, romantic air about us. Reunions, out of the blue reconnections and special events feed the soul. Moon also opposes Pluto in this monthly gesture. It can bring up fears and security questions or issues. Seek the support you need if this feels strong. Moon squares Jupiter continuing all mentioned in yesterdays' forecast, about family, loved ones, transitions and justice. Moon and Venus meet for family harmony and wonderful date nights! Today's color is Black. Saturday: Cancer Moon void from 11:17 am to 1:58 pm EDT. Moon and Venus aligned overnight for creating more peace with emotions and with loved ones. If you're in love, this may be a highly romantic time. Some will reconnect with former lovers or spouses now. Mercury retro is a good time to see how things go on a temporary basis and avoid long term expectations. The Cancer Moon squares Uranus, a planet active at this solar eclipse time (Monday). All that is sudden, exciting and unanticipated and that involves destruction and re-creation is the domain of Uranus. Breakdowns must often precede rebuilding, reawakening and growth. Are you taking apart your household so you can move to a better location? Or perhaps you feel you're losing everything you once had. Is that necessary so you can have a different and more enlightened life? These are not always easy transitions. Alternately, Leo Moon moves in and asks us to enjoy life today. What makes you happy and is healthy and enjoyable? Do that for a while. Today's color is Orange. Sunday: The eve of our powerful solar eclipse features Leo Moon meeting Mars, the warrior. Jupiter is in harmony with the Moon, from Libra, and Jupiter also aligns with Mars (as they say in the song "Age of Aquarius"). Whatever is going on, the energy is dynamic, active and bold. Find your inner Lion traits, like courage and self esteem. Also remember this is a time of clearing the way, of reconsidering and removing obstacles or situations that hold us down or back. Yet, the answers may not be clear while Mercury is retrograde. So if you drop one thing, the other may not be immediately right there waiting. Reflection time may be necessary. Live the processes rather than try for shortcuts or the easy way (which can become the hard or lengthy way sometimes). Leo is the sign of heart, backbone and strong will as well as creativity and children's issues and voices. May you learn from someone youthful today. Listen. Today's color is Gold. Monday: Solar Eclipse in Leo at 2:30 pm EDT, and at that time void of course Moon begins. The eclipse is near Regulus, a powerful star. All related to leadership, royalty, pride (the good or bad kind), heart, bravery, and victories is highlighted now. This solar eclipse continues a very active time of transitions that began July 23rd, continued with lunar eclipse two weeks ago, and lasts powerfully for another month. A six month cycle until the next two eclipses also begins. Uranus, the volatile, adventurous, rebellious planet forms trines to the Sun and Moon. Uranus is in the late degrees of Aries, the sign of birth, rebirth and initiative as well as war and anger. There are many ways this can play out in personal lives and in the world. Saturn retro is also an influence, from Sagittarius. The retrograde of saturn is almost over. Solutions may begin to present themselves, particularly in long term problems. It's a potent time for life changes, breaking unhealthy habits, overcoming addiction, facing up to what you've been running from, acting on creative and heartfelt inspirations to name a few positives. A major challenge will be how we deal with anger, violence, or misuse of power. I wish you the very best. Leos born now and those at the tail end of Aquarius, Scorpio and Taurus may feel this one most, if not today in the month ahead. Today's color is White. Tuesday: Virgo Moon began at 4:25 pm on Monday (though that was not the big story of the day). Now Sun moves into Virgo at 6:20 pm. This begins the last third of summer. Moon meets Mercury retro, opposes Neptune, and trines Pluto. The truth could be clouded by lies or fluff intended to distract you. You may begin a conversation or agreement that needs time to gestate, process and solidify in a few weeks when Mercury retro ends (September 5th). Mars and Saturn retro form a trine. I feel it's too bold and brash though it can be adventurous. This is not a good shopping day, and it may be best to lay low in general. Unsettled energy dominates the day. Wear Indigo for intuition and instincts. Wednesday: At this point in the forecasts, I feel like calling a chill out day! Someone may ask you for an answer or final word. It may not be the best time, but use your own good judgement to decide. Meditate, take time in nature, go fishing or walk in the woods or on the beach. The Moon and Venus favor harmony and connection to the water and earth. Void Moon in Virgo 4 pm. A good date night or relaxing evening at home. Libra Moon 9:05 pm EDT. Think and be peaceful. Organize if you must. Things are in flux. Today's color is Lavender. free Yoga and live music on Congress Square Park Portland, Maine Thursday, August 24th 5:30 pm. Don't forget! Grounding, meditative, slow flow and seated postures. Thursday: Pisces Moon void of course from 9:38 am EDT on. Leo Sun is in harmony with Jupiter for socializing, optimism, and opening the heart. Mercury in Virgo aligns with Venus in Cancer for relationships and communication. Do what's sensible and realistic while keeping feelings and sensitivities in mind. Today's color is Green for the heart chakra and the sign Pisces. Friday: Aries Moon time starts 1:22 am EDT. The waning Moon in an action starting sign may lead you to 'clean house'. Clear debris that you're certain you're done with. Be mindful and not impulsive since Mercury retro is already a factor. Avoid doing anything you'll wish you could reverse. Minds will be very changeable as will plans in the weeks ahead, for the remainder of August and into September. It's not a favorable day to shop or make a big purchase. Exercise, act on inspiration, clear a path for what's next or new, even without knowing what exactly is coming. Red is today's color. Saturday: Mercury retrograde officially begins at 9 pm in the sign Virgo. The retro will take Mercury back into Leo briefly from August 31st to September 9th. Mercury is retro, appearing to move backwards and retracing degrees of these signs until September 5th. With school shopping and September schedules in the works, it's not the most convenient time for a retrograde. Make minimal changes since things will shift again. Leave well enough alone, as my Grandmother would say. Enjoy reconnecting with friends and get back to unfinished projects you still have energy for. Aries Moon with a variety of aspects to planets. Do what feels most worthwhile and natural, and avoid forcing matters or pushing things to work when they're not really meant to. Today's color is Yellow. Sunday: Void Moon only from 4:01 to 6:40 am EDT. Sweet dreams during those hours. If you're awake, feel the in between nature of the void Moon and relax into the day or into sleep. Brush off or breathe well through feelings of urgency. Most things can wait. Taurus Moon stabilizes and favors long term decisions and loyalty. The Leo Sun trine to Saturn in Sagittarius may open your mind to options if you're attempting to solve or resolve something important. Pay attention to creative solutions and alternative ideas. Today's color is Orange. Monday: Taurus Moon engages with 6 planets directly and 2 in a less direct manner. 4th quarter Moon is at 9:15 pm EDT as the Moon squares the Sun in Leo. Today is likely to be busy and you may be asked to commit or agree to something. Mercury is retro so temporary arrangements may work best. Set an end date or a date to reconvene. Don't allow yourself to be pushed into anything you're not ready for. Spend time outdoors, appreciate nature, work in the garden. Abundance and prosperity are favored. Go fishing or collecting. Weed out what you're sure is ready to go. If you must shop, say for clothing, today is better than some Mercury retrograde days. Save receipts for the entire month and into the next. Void Moon 9:15 pm to 10:06 am EDT Tuesday. Today's color is Brown. Tuesday: Mercury opposes Pluto. The Moon moves to Gemini at 10:06 am. Communication, family business, home related concerns or decisions, and balancing emotions are some of today's themes. Staying centered and focused will help. Gemini Moon often leads to busy mind or multi tasking. Try to stay centered. Something that's been suppressed, hidden or emotionally charged will come up for discussion for some. This may be a completely internal, personal process or it may involve your family or your 'corporate family'. Today's color is Blue. Wednesday: This Gemini Moon day features the challenges of the sign, as squares form with other planets and there's an opposition to Saturn retrograde. Mars is in harmony with the Moon, however that could make conversations too strong or bold. Words could be misused in argumentative or egotistical ways. Communication and plans are challenged by the Moon/Mercury retro square. Be careful what or whom you trust or rely on. Today's color is Light Blue. Goat Yoga at Sunflower Farm in Cumberland, Maine on Thursday, August 17th 5:30 pm. Make a summer memory with yoga on the farm! Robin's Zodiac Yoga for eclipse and Leo season followed by baby goat meet and greet. Cash donations shared between me and the farm. Bring your whole family to this all ages, all bodies, yoga event! Harmon Road Cumberland. Thursday: Moon void of course from 5:38 to 8:37 pm EDT. We are warming up for a lunar eclipse, which is a Full Moon, in Aquarius on Monday at 2:11pm EDT. We are likely to feel and observe change in the air. The Moon meets Saturn in the 3 am hour (eastern time zone). Go over agreements, plans and considering important decisions that require maturity and courage. Saturn is retrograde until August 25th, in Sagittarius. The Moon and Uranus form a trine, feeding each others' fire, at 5:38 pm EDT as the Moon moves void of course. This is an exciting or precarious trine. Move thoughtfully through these hours. Capricorn Moon shift happens at 8:37 pm EDT and about 9 hours later the Moon will be exactly opposite Venus in Cancer, activating relationship and family matters. You may notice opposition or adversarial energies. You may also have a chance to meet someone in the middle and find compromise. Also note that Uranus moves retrograde at 1:31 am EDT. Less attention is given to outer planets retrogrades though a sudden back up or halt could be signaled. Today's color is Green. Friday: Capricorn Moon. Jupiter squares Pluto in Libra/Capricorn. Attune to how you or others use will, resources, and knowledge. How are control and power at play? Aim for what's grounded and fair. We are very close to the eclipse and sudden changes include closure, people departing, major decisions or events that precipitate such decisions. Strong judgement is called for. Seek right action and fair outcomes. Today's color is Black. Saturday: Capricorn Moon meets Pluto and squares Jupiter. Yesterday's forecast is entirely relevant today. The eclipse is a Full Moon, waxing now through Monday at 2:11 pm EDT. This is powerful and eventful period. Some of today's themes include facing fear, doing what's just. finishing products and projects and remaining grounded. Today's color is Gray. Sunday: It's the eve of the Lunar Eclipse, and the Capricorn Moon gives way to Aquarius Moon at 8:15 am EDT. Void Moon is 5:22 to 8:15 am EDT. Dreams activate. You may want to sleep late or feel like sleep is intermittent. Aquarius Moon is generally suited to group meetings and events, and connecting with like minded souls. Aquarius Moon will go on to oppose Mars early on Monday. That opposition may be disagreeable. It may also activate us around common vision, if we're fortunate and experience the positives during this eclipse. It's the first of 2 this month. All Full Moons lead to coming full circle, completions, closures and peaks, and sometimes to dreams realized in their fullest expression. Honor due dates. Mercury is about to be retrograde, starting the 12th. Today's color is Turquoise Blue. Monday: Lunar eclipse in Aquarius 2:11 pm EDT across from the Sun, as always, and across from Mars in Leo. Jupiter is supportive from Libra, which can assist with the right people at the right time, legal matters ready to resolve, and in some cases educational or travel decisions that must be made now or very soon. Mars opposition often does not make life easy. Mars is in Leo, sign of children, sometimes paternal in nature, and always youthful and resilient. Notice any of that in process. Today's color is White. Tuesday: Aquarius Moon aligns with Saturn retro in Sagittarius. This also applies to Monday since it's a late night/wee hours sextile. All that is global and wide in scope relates. Attention will be called to life decisions, the people involved and the travel, knowledge and wisdom required. Saturn is retro and retroactive is a word that could apply. At 3:07 pm the Moon aligns with Uranus in Aries, leading to sudden, spontaneous, combustible, or impulsive action and events. Watch your step, drive safely, avoid confrontations for now. Moon to Pisces at 5:56 pm EDT. Romance, imagination and dreams are featured for the evening. Being by the ocean or lake is a Pisces Moon plus. Today's color is Light Blue. Wednesday: Pisces Moon through Thursday. The Moon harmonizes with Venus in Cancer for romance and creativity. Seek harmony through communication even if it seems like the opposing sides are strong. Mercury is across from the Moon and set to retrograde for about 3 weeks starting on the 12th. Perhaps you can reach a temporary compromise or plan today. Take a soft, easygoing, non confrontational approach to be in harmony with Venus, Mercury and the Moon in water and earth signs. Less is more is a phrase that comes to mind. Moon and Neptune fuel romance and imagination as they meet in Pisces. However they also make it easy to slip back into patterns of escapism, substance abuse, and denial. Can you stay real and true, clear headed and willing? Today's color is Pink. Thursdays in August! I would love you to join us and feed your soul with outdoor yoga on a farm or in our small city! Robin's Zodiac Yoga with baby goat petting and all the farm has to offer on August 17th 5:30 pm at Sunflower Farm in Cumberland Maine. Your donations are shared between me and the farm. It's a wonderful outdoor yoga spot. I hope you can come! Robin's Zodiac Yoga with live music by Todd Glacy, Sacred Sound and Healing, on Congress Square Park Portland, Maine near the art museum and State Theatre August 24th at 5:30 -6:45 pm. Intro to Yoga Nidra is September 8th, Friday 5-8 pm. Are you ready to heal your soul, start a meditation practice you can do any day, and gather with others who are doing the same? Deep rest, a receptive state, the path to taking care of stress, emotions, and your true self. At Scarborough Yoga. Sign up here or in the Oasis/Scarborough Yoga space at 433 US Rte 1. Link here. If you're more deeply interested, do the entire weekend training and you can lead and write your own yoga nidras. 20 Yoga Alliance credits for yoga teachers. All are welcome. Link here.